A few months ago, the London-based valuation firm Brand Finance released a survey of the world’s most valuable brands, ranking them by their worth in millions. Atop the Global 500 sits what one might expect: the modern-day captains of industry, the multinational technology giants Apple, Google, Samsung and Microsoft—with mega retailer Wal-Mart rounding out the list’s top five. The surprise, however, may be that none of these billion- dollar enterprises achieved the highest brand rating this year. Other big name brands—Coca-Cola, PWC, Hermès—also fell short. In fact, the lofty laurels of “Most Powerful Brand in the World” went to a niche sports-car manufacturer with humble racing beginnings in Italy. According to Brand Finance, in terms of raw brand power, a loyal market, net profit margins and unmistakable personality, Ferrari is king. Long live the prancing horse! If social media is any indication of brand presence in this world, then Ferrari is doing something right. A scan on Facebook shows that Ferrari’s page has more than 11,000,000 “likes”—that’s two million more than Apple, in case you were wondering. In Formula One racing, Scuderia Ferrari (Team Ferrari) has more than half a million followers on Twitter. As these towering social media statistics illustrate, Ferrari has figured out how to generate mass-produced desire on a scale unmatched by most luxury brands. This is all the more remarkable when you realize what forces were aligned against Ferrari, because it certainly wasn’t an easy ride to the top. In the past year, while austerity measures cut deep swaths in the coffers of Italian businesses, and raids by the Guardia di Finanza—the Italian policing agency that deals with financial crime—sent many owners of exotic and luxurious Italian cars rushing to export their beloved supercars to markets in Germany, France and Eastern Europe to avoid conspicuous tax evasion, Ferrari somehow emerged from the fog of uncertainty, posting record financial numbers in 2012. Ferrari sold a total of 7,318 cars last year—an increase of 4.5 percent— outpacing the record number sold in 2011. This uptick is credited with helping to boost revenue to $3.2 billion in 2012, a net profit of $325 million and a return on sales of 14.4 percent. It’s no surprise, then, that last month Ferrari CEO Amedeo Felisa claimed the business had set aside at least $300 million for R&D to reduce emission production in the next five years. Can you say LaFerrari ten times fast? With so much arrayed against a luxury manufacturer, what, then, is the secret to driving such profitable growth? And how do seemingly immeasurable intangibles like having a “strong” brand work in its favor? Of course, similar to Formula One and sports car racing, anything is possible in this globalized world economy. And with proven markets in the US, China and Japan, Ferrari is still showing off new tricks, on and off the racetrack. The fierce, team- spirited business founded by Enzo Ferrari in 1929 has since become an international icon for the epitome of craftsmanship, discovering in the process how to continually stay fresh, exciting and ahead of the pack. The story of Ferrari’s rise is so much more than an exceptional brand capitalizing on success. The Ferrari saga, at its heart, is a love story. Though the cars that would carry his name wouldn’t be invented until 1947, the soul alive in the race car design of every Ferrari model produced today is irrevocably tied to the legendary life of its founder. In his early years, Enzo Anselmo Ferrari showed a lack of interest in school. Instead, his passion was auto racing, a burgeoning sport that was fast, dangerous and widely publicized, with cars and their drivers capturing the attention of audiences worldwide. But what we have come to expect of the Ferrari sports car today is more a product of Enzo Ferrari’s years in the pit, on the factory floor and as eventual leader of his eponymous company. His career racing Alfa Romeos almost 20 years prior to building the first Ferrari (the 125 S) did, however, give rise to a motif that would define a brand. Similar to courageous fighter pilots facing combat in World War I, and because of the hazardous nature of the sport, racecar drivers were never sure they’d live to see another race. So in an act of solidarity, the mother of Count Francesco Baracca, an ace fighter pilot shot down during battle in WWI, invited Ferrari to use the symbol of the prancing red horse emblem that decorated the fuselage of Baracca’s planes. The crest has largely stayed the same and to this day, the badge signifies a long history of racing prestige. In some ways, given the world we live in, it also seems representative of an unrealistic pinnacle of perfection, an impossible archetype, but one that doesn’t stop the fervent idolization associated with it one bit. It doesn’t take a Ferrari owner to tell you that such cars are the incarnation of luxury perfected. Addressing a congregation of more than 250 members of the car-savvy media at the automaker’s Maranello factory, Luca di Montezemolo, Ferrari’s chairman, made a promise at a recent expo: He would keep Ferrari production exclusive while increasing working-class job growth in his native country of Italy. 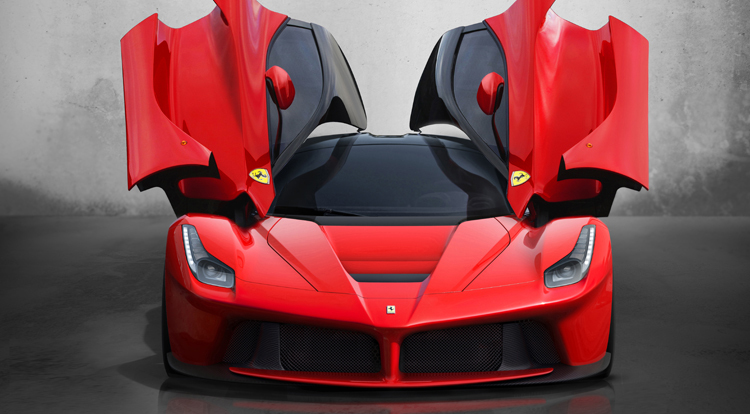 Wedding both innovation and exclusivity is the LaFerrari, a hybrid supercar making good on Montezemolo’s promise. Only 499 will be built. As a testament to the charismatic presence of Ferrari, di Montezemolo’s merchandising has achieved a rare level of ubiquity. Nowadays you can find the Ferrari DNA coursing through blow dryers, cameras, watches, hats, sunglasses, headphones, skis, laptops, golf clubs, mountain bikes, surfboards, roller skates, scooter helmets, cuff links and not to mention a wardrobe for the entire family. “My father always had one objective in mind: Always improve,” says the founder’s son, Piero Ferrari. And it’s in this determination that the Italian racing company has created a symbol of excellence known in every corner of the planet. Like any love story, the passage of time is the true testament of passion, as flames wane and burn out, or, with luck, grow stronger. The romance with Ferrari burns all the brighter.